Alaska Airlines celebrated a historic, long-awaited moment for Western Washington today with the first commercial flights at Paine Field-Snohomish County Airport (PAE) in Everett. Paine Field is now home to Alaska’s newest destination and the nation’s newest commercial air terminal. The first departure yesterday morning headed for Portland, Oregon (PDX) and was operated by Horizon Air E175 registered N643QX. 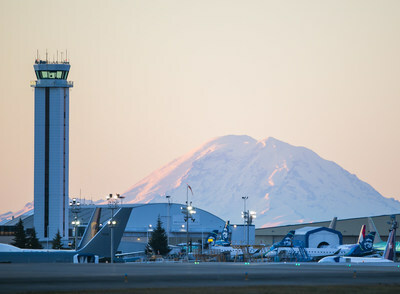 Located about 30 miles north of the Seattle metropolitan area, and roughly 50 minutes away from Seattle-Tacoma airport, the two-gate airport was ready to open its doors. First constructed in the 1930s, PAE has been an industrial, military, and general aviation airport for most of its existence. Also home to Boeing’s assembly lines, this airport has been the birthplace of planes as big as the 747. The opening of the airport, which was due in January, has been delayed by the government shutdown. The new Alaska service provides travellers – especially those who live north of Seattle – with an easier, more convenient option for catching a flight. By mid-March, Alaska will have its full flight schedule of 18 daily nonstop departures to eight West Coast cities – places customers have told they want to fly to. New commercial air service at Paine Field is expected to save time and money for the more than one million travellers who live in North Puget Sound. They’ll enjoy shorter commutes to Paine Field, easing traffic congestion and hopefully reducing stress levels. Although Everett is the home of a Boeing plant, all Alaska flights at Paine Field are operated by Horizon Air with an Embraer 175 aircraft, which features a three-class cabin, including an exceptional first class, and premium class with complimentary cocktails, wine and craft beer, plus extra legroom. Commercial flights from Everett are expected to ignite economic development by increasing visitors to the area and attracting new businesses. Over the years, Alaska has remained extremely proud of its contributions to Washington’s economy. Along with local vendors, manufacturing partners and technology providers, Alaska contributed $7 billion to Washington’s economy in 2017. Alaska is grateful to have a role in the airport’s continued success and very appreciative of the support of the Snohomish County community, business partners, government officials and agencies, plus employees who all came together to make this launch possible. Every seat on the E175 is either a window or an aisle – there are no middle seats. Guests can enjoy more than 500 free movies and TV shows on their own devices, free texting, and new, West Coast-inspired fresh food items and beverage selections onboard. It’s all a part of Alaska’s award-winning service and focuses on offering low fares, great value and outstanding service to our guests. From Paine Field, guests can fly to eight West Coast cities: Las Vegas; Los Angeles; Orange County, California; Phoenix; Portland, Oregon; San Diego; San Francisco; and San Jose, California. Tickets for all Paine Field flights went on sale Nov. 15, 2018. United Airlines will also join the service offering to Denver and San Francisco launching at the end of this month.